What if Star Wars…had flopped? I wouldn’t trade Yoda, not even for Princess Leia wielding a lightsaber against Darth Vader himself, but that may have been the deal fans were forced to make if the original Star Wars film had been a flop. Back in the late 1970s, as George Lucas was preparing his space opera for theaters, sci-fi novelist Alan Dean Foster was doing his part, ghostwriting the novelization of the screenplay that would become A New Hope and penning its sequel. As the story goes, the second novel was envisioned as the framework for a possible low-budget film if the first movie tanked at the box office. Foster wrote the tale under strict guidelines to minimize costs, essentially eliminating high-flying space battles and editing out Han Solo entirely because Harrison Ford had not yet inked a deal to reprise his role. Viewed through the lens of history nearly 40 years later and the book, Splinter of the Mind’s Eye (with cover art by Ralph McQuarrie, no less!) exists in a weird nexus of what might have been, an homage to the first glimmer of the larger world Lucas had created and its ability to ensnare the imagination. The story follows Luke and Leia after they’ve crash-landed on a strange jungle planet while on a mission for the Rebellion. Along with their trusted droids, C-3PO and R2-D2, they stumble upon a secret Imperial energy mining colony and spectacularly fail to blend in at the local tavern. Their appearance attracts the attention of a sassy, fast-talking old woman named Halla, as well as some Imperial eyes, and their mission quickly turns into a race against time in the hopes of securing the mysterious Kaiburr crystal, a gem that has the power to focus the Force and could do untold damage in the hands of the Empire. log some summer reading hours. There was a copy of Splinter of the Mind’s Eye on my parents’ bookshelf, squeezed between other musty sci-fi novels of a similar breed, which called to me when I was a kid just discovering the Star Wars universe for the first time. I remember the excitement of diving into an extension of the saga, but honestly up until a recent re-read the rest of the details were as murky as the mud on Mimban. I have a vague idea that I was confused on my first foray because Luke and Leia seemed to have a lot of weird sexual tension and Vader didn’t even mention being their dad. By that point, I had seen the whole original trilogy. Of course, when Foster was writing Splinter, Lucas hadn’t even written Episodes 5 and 6 yet. There was no Lando in Cloud City. No Boba Fett stealing away with a Carbonite-encased Han in his hull. No Ewoks. And so there was no definitely no inkling in the public consciousness that Luke and Leia were twins separated at birth and that the Dark Lord of the Sith was dear ol’ dad. Taken in context, Splinter is an enjoyable romp with familiar faces and the first look at the vast unknown landscape where many published authors and fanfiction writers have ventured since. Now part of the Legends series, the novel also seemingly winks at imagery and references that would eventually make their way into the official canon. For the most part, Foster captures Leia’s indomitable spirit, but the Luke he writes is much more self-assured than the farm boy we left behind at the end of A New Hope. To be fair, the story takes place two years after the Battle of Yavin, and young Skywalker has been spending his time in-universe as a pilot with the Rebellion. He’s also been working on his lightsaber maneuvers, although his abilities with using the Force to levitate objects still leaves something to be desired — a fact that resurfaces in The Empire Strikes Back when he struggles to get his X-wing out of the Dagobah swamp. Somewhat like Empire, the action is taking place on a swamp jungle planet and our heroes are frequently separated from their friends as the plot moves forward. Like its predecessor and later sequels, the story includes an appearance by Darth Vader, limbs severed by lightsaber blades and rebuilt again with technology, a grizzled Force-sensitive elder leading Luke on a new adventure, furry behemoths who can turn a man into mush (this time a role filled by the delightful Yuzzem), sassy droids, comedic banter, sexual tension, and a primitive tribe (this time the Coway) that at first wants to fight our heroes but eventually decides to join forces. 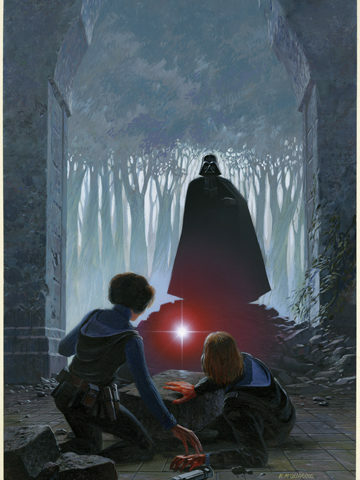 Foster’s writing is enjoyable, from his descriptions of Luke’s lightsaber’s “shaft of azure destruction” and the local cuisine that “tasted like reprocessed X-wing fuselage insulation,” to his bold choice of pinning Luke beneath an immovable rock so Leia is forced to take up the lightsaber and battle Darth Vader for herself. In this telling, she isn’t Force-sensitive (and she doesn’t know how to swim), but she does manage to hold her own and survive some gnarly battle wounds. It’s a scene I would have loved to have seen play out on celluloid, although one could argue The Force Awakens neatly makes use of the imagery sans boulder by subbing-in Rey for Leia. And the since-revised kyber crystals have made a big impact on more recent canon fodder, including in Rogue One, the book Catalyst, and the Clone Wars TV series, although this time the mysterious temple-protected crystals explain lightsaber functions and help harness power for other destructive weaponry. Reading Splinter today, the story functions like an alternate, parallel universe. But the once best-seller supported by Lucas himself still feels like a classic even if it doesn’t fit neatly into the Star Wars world we’ve come to know in the years since. Next article Save 20% at TeePublic With Our Exclusive CWK Discount Code -- EXTENDED Through 7/16! Previous article Star Wars Forces of Destiny Review: "The Padawan Path"